Not So Perfect Karthi: Sisyphus! I feel ya bro! Sisyphus! I feel ya bro! Was it just yesterday that the whole of Kerala was broiling in the high 30s? It's 4 in the afternoon now and I feel I should snuggle beneath my blanket and burrow into my pillows to take a cozy nap! I haven't seen the sun in a couple of days. Karthi was hit by the seasonal cold and cough, just in time for school reopening. Our kids grumblingly went back to school and I did the victory dance at home at the beginning of the month! Yay, free, free at laaaast! After our Lakshadweep trip (Click on the numbers to see Parts 1, 2, 3 and 4. ), I devised a project for the kiddos and I to do this summer. Karthi's garden was sadly neglected, fully overgrown and undernourished. So for a month, everyday for an hour before the sun got hot, we hoed and swept and pruned the areas around Karthi till it was all neat and clean. We even made slanted brick borders - that is, the kids carried the bricks for me while I made wonky, wavering lines with them. We got a load of cow manure and fed each and every plant in our yard. My hands got scratched by the bougainvillea that I tried to tame and train over the wall so that next February the people who pass our road too can share the joy of the blossoms. And see what it looks like today! See that brownish line going off into the distance? That is one of my beautiful (if I say so myself) brick borders that is currently being choked by the rampant weeds!!! Does it even look like I was trying to hand-weed the whole as it was growing everyday in June??? So I had to break out the big guns again! Yep, the rake and the hoe are back and fighting the good fight once again after a verrrrrry short break. Don't they look a bit shell-shocked? "Oh no, not again! ", they seem to be saying. Now my garden team and I know what Sisyphus felt like. But hey, you should feel my arm muscles! Nothing better to build strong arms than half an hour's hoeing each day! 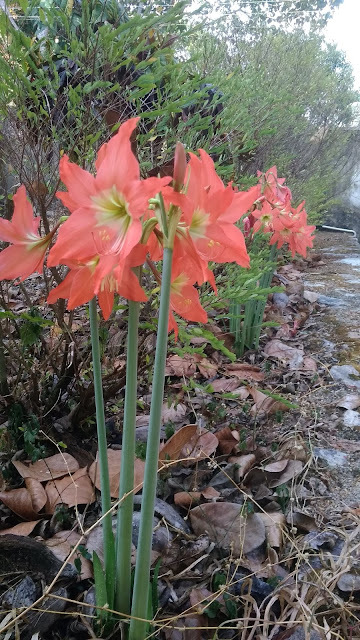 Meanwhile a few blooms here and there smile at me while I work. Doesn't look like much? Well that is a Parijatam (we call it Pavizha Mulla too, a tribute to the flower's coral stem) that I have been trying to grow for several years now. My attachment to this plant is a little story. The first place in my peripatetic life that I really called home was my mother's home where my cousins and I played beneath one of these very trees. Every morning there would be a carpet of the distinctive orange-stemmed blossoms beneath it. I always collected them although they wilted pretty quickly, tired out after working to give off their fragrance the whole night. When my parents quit the Gulf and settled in Kerala, my mother got a bit off the old tree and planted it near their bedroom window. It prospered and I got to see the same carpet of flowers for years afterward. The years passed and they sold that home to settle near us. One of the things I asked them to bring from home was a cutting of this very tree. But it did not take hold. For four years afterward, I tried the same several times, but it just didn't take root. I reasoned that the cuttings probably died on the journey from Kottayam to here. So in 2014, I asked my aunt to take a cutting of her Parijatam (which came from our old one, see, it's a family thing!) and grow it in a plastic bag. She planted several cuttings and one took root. When I went to Kottayam for Onam that year, I collected the bag and brought it here. It had a tiny, weak stem and four light green leaves at that time. For almost 6 months I kept it in the shade and took care of it as if it were a baby. I watered it, fertilized it, talked to it, in fact I did everything short of playing Beethoven to it till it grew stronger stems and put out the dark green leaves all over. My gloves will tell you of my hard work. Oh, I have to introduce you to my new gloves. Ever since I wore out a pair of gardening gloves that a dear friend of mine brought me from the US, I had been looking out for new ones. All I could find were latex ones that tore at the least provocation. Then a few months ago, I saw these at Pothys! They are made of knit cotton and can stand up to hand weeding and touch-me-not prickles. They can handle roses too with a little care and if they couldn't prevent the bougainvillea from hurting me, it was not their fault. See, they cannot hop on to my hands by themselves, can they? Yeah, I am intrepid like that. I fight the bougainvillea with bare hands. Ouch!!! The only problem is that the kids think these gloves are good for wicket-keeping and take off with them. So I now have several pairs. In fact, it seems I pick up a pair whenever I go to Pothys these days! At around 40 bucks a pair, they are quite affordable. They are made here in Thiruvananthapuram, so I get a boost out of supporting a local manufacturing business too when I buy them (gimme a reason, any reason!). I wash them under the garden tap to remove the grit and toss them with my daily wash. And I have extra pairs on hand for the next day because in this weather, they take a little long to dry. Happiness is truly in the small things!!! That's all for now. For all my griping, am enjoying the rains very much! As is this guy on our front porch! Wanna meet him? That's another post! Nice pictures. I love the pink flowers. we have the same but in blue color in my mom's home.